This work was undertaken to investigate the effect of variations of the feed rate on a fed-batch set-up used to degrade xenobiotics. The mixture of substrates was composed of PCP, 2,4,6 TCP and 2,3,5,6 TeCP (pentachlorophenol, 2,4,6 trichlorophenol and 2,3,5,6 tetrachlorophenol respectively). Two acclimated bacteria isolated from soil were used: Pseudomonas aeruginosa and Achromobacter sp. nov. The different flow rates tested were: I: 0.5 m·ℓmin1, II: 1.67 m·ℓmin1 and III: 2.00 m·ℓmin-1. Our results show that during fed-batch operation the 2,4,6 TCP exhibits an earlier degradation than the other compounds, for all of the flow rates tested. This indicates that in this case the degradation of the most recalcitrant compounds (PCP and 2,3,5,6 TeCP) is benefited by the increase in biomass of bacteria, due to the metabolisation of a less recalcitrant compound (2,4,6 TCP). The defined parameter, specific degradation rate (SDR), was demonstrated to be very useful for comparing the degradation abilities at different flow rates of a fed-batch system. The degradation efficiencies were shown to be higher than 90% for all of the cases and to decrease as the feed rate increases. However, the SDR, a parameter that involves the rate of degradation and the biomass, increases as the flow rate increases. At a feed flow rate of 2 m·ℓmin-1 SDR reaches a maximum of 12.476 x 10-10 mgCP-h-1-CFU-1. Finally, among the feed flows tested, taking into account both the degradation efficiency and the SDR, 2 m·ℓmin-1 is the most convenient flow rate for chlorophenol degradation in fed-batch systems. An even higher degradation efficiency (97%) can be achieved by using the feed rate of 2 m·ℓmin-1 followed by an additional batch post-treatment of 2 h, with a SDR of 13.136 x 10-10 mg CP-h-1-CFU-1. Microbial biodegradation processes in aerobic or anaerobic reactors are among the most widely used biological methods for removing chlorinated phenolic compounds (CP) from contaminated waters. The exploration of new cultures capable of degrading xenobiotics without the addition of ancillary carbon sources is an approach that may result in significant cost reductions in the decontamination process. Field and Sierra-Alvarez (2008) have summarised a wide spectrum of strains of bacteria and fungi which are capable of using CP as the sole carbon and energy source. While most researchers have studied biological treatment in batch reactors, several authors have proposed alternate configurations to improve the industrial application of CP degradation (Mun et al., 2008), including fed-batch reactor systems (Bali and Sengul, 2002; De Los Cobos-Vasconcelos et al., 2006). The fed-batch system allows for the treatment of larger quantities of wastewater than the batch system, with the same amount of initial inoculum (Blanch and Clark, 1996). In a typical fed-batch operation, wastewater is fed to the biological treatment unit either intermittently or continuously, usually at a low flow rate. Contrary to the continuous systems, the effluent is not withdrawn until the reactor is full. In this way, high concentrations of organic and toxic compounds are diluted in a large reaction volume, thus reducing inhibitory/toxic effects. As a result, biological oxidation of these compounds usually takes place at a higher rate (Bali and Sengul, 2002). In addition to their toxicity, CPs are the direct precursors of more dangerous compounds such as polychlorinated dibenzodioxins. CPs have been used extensively for the synthesis of many kinds of compounds such as pesticides, herbicides and dyes. Thus, CPs are found in various industrial and municipal wastes (Ozkaya, 2005; Majumder and Gupta, 2007; Tzou et al., 2008) and several wastewaters contain PCP, present in mixtures together with other CPs and aromatic compounds (Majumder and Gupta, 2007; Durruty et al., 2011). The degradation rate of one or more compounds may be altered when they occur within a mixture of toxic compounds: the rate may be stimulated, inhibited or decreased (Abuhamed et al., 2004; Baggi et al., 2004; Liu et al., 2006). Since during simultaneous degradation the presence of other compounds can enhance or decrease the PCP degradation rate, it is important to know how the additional substrate may affect the overall degradation. Most CPs can be co-metabolised in the presence of an easily degradable carbon source (Kim and Hao, 1999; Wang and Loh, 2001; Tobajas et al., 2010). A possible strategy worth exploring is the use of lower chlorinated phenols in multi-substrate degradation to improve the overall degradation rate, instead of using easily degradable substrates. This is so because the use of readily-degradable ancillary carbon sources, such as glucose or amino acids, may favour the growth of tolerant but not CP-degrading microorganisms present in the CP-wastewater and which could compete with the degrading flora. The effect of a secondary chlorophenol on the removal of another chlorophenol present in the mixture has been investigated using batch (Yang et al., 2005; Tobajas et al., 2010) and fed-batch systems (Quan et al., 2005; De Los Cobos-Vasconcelos et al., 2006). In previous work (Durruty et al., 2011), it has been demonstrated that the presence of 2,4,6-TCP (2,4,6 trichlorophenol) enhances the PCP degradation rate by the same culture in a binary mixture and in ternary mixture of 2,4,6TCP; 2,3,5,6TeCP (2,3,5,6 tetrachlorophenol) and PCP. However, the biodegradation behaviour of the PCP, 2,4,6 TCP and 2,3,5,6 TeCP mixture in fed-batch systems remained unexplored. Therefore, this work was undertaken to study the multi-substrate degradation of PCP, 2,4,6 TCP and 2,3,5,6 TeCP in a fed-batch system, and the effect of different feed rates on system behaviour. These results add to the knowledge of fed-batch operations used to improve the degradation of mixtures of xenobiotics. The mixed culture used in this work consisted of 2 strains isolated from soil contaminated with CP in the city of Mar del Plata: Pseudomonas aeruginosa (Murialdo et al., 2003) and Achromobacter marplatensis (Gomila et al., 2011) in a 1:1 ratio. They were isolated in the laboratory from soil contaminated with chlorophenols (Murialdo 2004; Wolski et al., 2006). These strains were selected for our research because they showed the best chlorophenol degradation kinetics among the isolated strains (Murialdo, 2004). In addition it has been shown that mixed cultures usually perform better than pure cultures (Sahinkaya and Dilek, 2007; Salmeron-Alcocer et al., 2007). A stock culture of bacteria was kept in liquid medium prior to its use in the experiments. The medium (MS) contained the following inorganic salts (g·ℓ-1): PO4K2H (0.65); PO4H2K (0.17); NH4CL5 (0.05); NaNO3, (0.05); MgSO4.7H2O (0.1), and a mixture of PCP (20 mg·ℓ-1), 2,4,6 TCP (20 mg·ℓ-1) and 2,3,5,6 TecP (20 mg·ℓ-1) as the only source of carbon and energy. Before inoculations, all media were adjusted to pH 7 and autoclaved at 121ºC for 15 min. The bacteria were acclimated as described in Durruty et al. (2011). 4.6 x 250 mm Analytical Column (Millipore Corporation, Milford, Massachusetts). The UV detector was set at 219 nm. The mobile phase was acetonitrile and 7 mM phosphoric acid (70:30, v/v) with a flow rate of 1 m·ℓmin-1. 0.5 ℓ in all cases and the medium was pumped into the reactor until a final volume of 2 ℓ was reached. Samples were drawn at different time intervals to measure the concentration of each CP. The biomass was quantified at the beginning and at the end of the fed-batch operation. For comparison purposes, a batch system process was carried out simultaneously as a control, using the same inoculum as in the fed-batch experiment. The test was conducted in 250 mℓ Erlenmeyer flasks containing 0.15 ℓof the MS and PCP, TCP and TeCP as the only source of carbon and energy. The batch control reactor was inoculated with the enriched liquid from the fed-batch reactor at t = 0 h. Initial CP and biomass concentrations are shown in Table 1. The cultures were incubated in a dark room, at 25ºC with constant agitation (120 r·min-1) in an orbital shaker (Shaker Pro, Vicking Co. Buenos Aires, Argentina). The first term ([dVS/dt])acc represents the net accumulation of acc the component i in the control volume V, while F-Sif represents the input of compound i to the volume control, and the last term ([dVS/dt]deg) represents the actual degradation rate. Note that the control volume V is not constant since the volume V increases at a rate dV/dt, which is equal to F. Therefore, Vt)=V0 + Fµt. Note that in Eq. (3) Ci represents the cumulative mass of the i compound added to the actual volume at each time. This parameter is a very useful tool that involves the degradation rate and the biomass growth, referred to the initial biomass instead of the actual biomass. Progressively, the biomass grows and the degradation rate increases. This parameter simultaneously takes both into account. The mixed culture constituted of Pseudomonas aeruginosa and Achromobacter marplatensis was able to simultaneously degrade the mixture of highly-substituted chlorophenols PCP, 2,3,5,6-TeCP and 2,4,6-TCP, as the only source of carbon and energy in batch and fed-batch systems. The initial experimental settings for the fed-batch assays at different feed flow rates (I, II, III) and the batch system control (B) is shown in Table 1. The initial biomass was similar in all cases but the initial CP concentrations were much higher in B than in the fed-batch assays when they were close to zero (Table I). The substrate to biomass yield coefficients based on total CP degradation are also shown in Table 1. These values are higher than those previously reported by Durruty et al. (2011) for the same strain and acclimated condition, exposed to similar CP concentrations but with lower biomass concentration. These results support the observation of Moreno-Andrade and Buitron (2003), who observed that growth inhibition is not only a function of the initial substrate concentration, but also of the initial biomass concentration. This is due to the fact that the concentration of toxic compounds to which the biomass is exposed is lower per unit of biomass, thus the toxic effects are reduced. The actual concentration of different CPs in the 3 fed-batch assays during the first 10 h, and the total amount of substrate added (Ci) for each, calculated with Eq. (3), are shown in Fig. 1. The degraded CP concentration is represented by the difference between C and the measured CP concentration. The degradation rate is represented by the difference between the first derivative of the accumulation (the slope of the curve C vs. t represents the accumulation rate) and the first derivative of the actual concentration (slope of the curve S vs. t represents the net degradation rate). Therefore, the difference between the slopes of the curves is proportional to the degradation rate. In Assay I, the degradation rate was higher than the accumulation rate for all of the CPs (Figs.1, Ia, Ib and Ic), and the concentration diminishes from the start (negative net rate). In conclusion, the feed limited the degradation rate during Assay I. In Assays II and III the compounds accumulated initially because the degradation rate was slower than the accumulation rate (positive net rate). Later, when the increase in biomass causes an increment in the degradation rate, it exceeds the accumulation rate (negative net rate) and the CP concentration decreases. In the case of PCP, degradation was slower than for the rest of the CPs. This was evident in Assay III (Fig.1, IIIa) when the accumulation rate is the highest. The actual concentration of PCP increased proportionally with the increase in volume of the reactor, close to the theoretical accumulation. This indicates a low degradation rate. After 5 h it began to degrade faster, due to the increase in biomass. The low accumulation of 2,4,6 TCP during Assays II and III (Figs.1, IIc and Figs.1, IIIc, respectively) indicates that the bacteria consume this compound as it enters the reactor. The 2,3,5,6 TeCP degradation followed a similar trend to that of the PCP degradation: it was accumulated during Assay III until Day 5 (Figs.1, IIIb); both presented a minor accumulation in Assay II until Day 3 (Figs.1, IIa for PCP and Figs. 1, IIb for 2,3,5,6TeCP). In all of the cases the concentration of 2,4,6 TCP reaches its maximum before that of the other compounds, indicating an earlier degradation of this compound. The fact that this maximum is also lower than the other 2 maxima indicates that the 2,4,6 TCP degradation is faster. This suggests that in this case the degradation of the most recalcitrant compounds (PCP and 2,3,5,6TeCP) is benefited by the increase in biomass of bacteria, due to the metabolisation of a less recalcitrant compound (2,4,6 TCP) (Guha et al., 1999; Durruty et al., 2011). This agrees with the results of Quan et al. (2005), who found that in the fed-batch system with mixed components, 2,4DCP (less recalcitrant) was always degraded first; when it reached near-complete removal, the degradation of 4CP (more recalcitrant) started to take place. The final values of specific degradation rate (SDR) for the fed-batch assays at different feed flows (I, II, III), calculated with Eq. (4), and for batch control (B), calculated with Eq. (5), are shown in Table 2. The values of the operating time (h), feed CP concentration (mg·ℓ-1) and maximum CP concentration (mg·ℓ-1) reached during the test for each assay are also shown in Table 2. In Assay I, although the amount of degraded CP is greater than in the batch test, the time necessary to process the CP makes the SDR lower due to the low feed flow, and limits the net degradation rate. The CPs are highly toxic and usually exhibit substrate inhibition (Kargi et al., 2005; Chen and Lin, 2006; Konya et al., 2007), although the concentration at which the compound starts to inhibit depends strongly on the strain and the acclimation procedure (Moreno-Andrade and Buitron, 2004; Sahinkaya and Dilek, 2005). For the culture used in this work, under the conditions described above, the onset of inhibition in PCP degradation was observed from 40 to50 mg·ℓ-1 of PCP (data not shown) and the degradation did not take place at initial concentrations above 150 mg·ℓ-1. This suggests that the values of total CP concentration must be maintained below 50 mg·ℓ-1 to avoid a detrimental effect on total CP degradation. Thus, the marked increase in the SDR obtained in Assay II and III is attributed to the feeding strategy, which allows lower levels of toxic compounds to be maintained in the fed-batch reactor in spite of the fact that the concentration of the toxic compound in the feed (135 mg·ℓ-1) is higher than that which the culture is able to withstand. (Blanch and Clark, 1996; De Los Cobos-Vasconcelos et al., 2006). In our experiments, even though the feed concentration was more than twice as high as that to which the bacteria were acclimated, the maximum CP concentration in the reactor (that to which the bacteria are actually exposed) (Table 2) never exceeds the acclimation concentration. Therefore, the detrimental effects of substrate inhibition on CP degradation are avoided. These results agree with those of Bali and Sengul (2002), who concluded that the feeding strategy is a key factor for complete removal of both growth and non-growth substrates in fed-batch operation with no acclimated bacteria. The degradation efficiency, measured as the ratio between the total degraded substrate and the total fed substrate, is shown in Table 2 for each test done. In all cases degradation efficiency was higher than 90% and decreased as the feed flow *45 mg-l-' of each CP increased. These results are similar to those found by De Los Cobos-Vasconcelos et al. (2006), who reported degradation efficiencies between 93 and 100% in the fed-batch reactor during the simultaneous degradation of mono-and dichlorophenols by a strain of Burkholderia. On the other hand, in the range of feed rates evaluated, the SDR, which involves degradation rate and biomass requirements, increases with higher feed flow rates. But, as the feeding rate increases the concentrations begin to approach the values to which the bacteria are acclimated (Table 2). Tests at higher feed flow rates must be performed to confirm this tendency, although, based on the results obtained in this work, it is expected that a very high feeding rate could lead to an excessive accumulation of toxics compounds, which will have deleterious effects on the degradation efficiency and even prevent degradation. In summary, during Assay III, at a feed flow rate of 2 mℓ·min-1, the SDR reaches a maximum of 12.476 x 10-1 0 mgCP-h-1-CFU-1; however, the lowest degradation efficiency is achieved. This results because at the time that the maximum working volume within the reactor was reached, some accumulated CPs still remained inside it. Nevertheless, an additional batch time of 2 h is sufficient to reach a degradation efficiency higher than 97%. Application of Assay III plus this additional batch post-treatment resulted in an SDR of 13.136 x 10-1 0 mgCP-h-1-CFU-1. Thus, a flow rate of 2 mℓ·min-1 demonstrated better degradation abilities for a mixture of CP than lower feed flow rates and than a batch process. 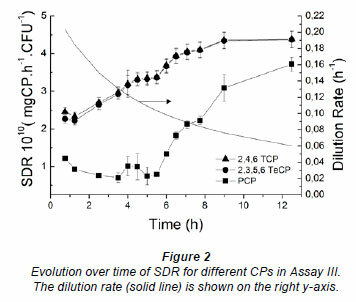 Figure 2 shows the evolution of the SDR for different CPs in Assay III. The SDR for 2,4,6 TCP and 2,3,5,6 TeCP increases as the dilution rate (D) decreases (Fig. 2). This demonstrates that, once the operating conditions are chosen, with longer operating times (larger final volumes) the degradation ability increases. The SDR for PCP, however, deteriorates initially due to the slower degradation rates (as discussed above). After 5 h, when the total degradation rate is higher than the accumulation rate due to the lower dilution rate, the SDR for PCP begins to increase. In this case, an operating time lower than 6 h will be sub-optimal for degradation of most recalcitrant compounds. The results obtained in this work indicate that the selection of a reaction system in combination with its operating conditions is a key factor for the improvement of toxic-substrate biodegradation rates. Further insight into the degradation process could be gained by varying the initial concentrations and the operating temperature. The mixed culture constituted by Pseudomonas aeruginosa and Achromobacter sp. was able to simultaneously degrade the mixture of highly-substituted chlorophenols, PCP, 2,3,5,6-TeCP and 2,4,6-TCP, as the only source of carbon and energy in batch and fed-batch systems. During fed-batch operation the 2,4,6 TCP exhibits an earlier degradation than the other compounds, for all of the processes applied. This indicates that in this case the degradation of the most recalcitrant compounds (PCP and 2,3,5,6TeCP) is benefited by the increase in biomass of bacteria, due to the metabolisation of a compound less recalcitrant (2,4,6 TCP). The defined parameter, SDR, was demonstrated to be very useful for comparing the degradation abilities at different flow rates for a fed-batch system. The degradation efficiencies were higher than 90% in all of the cases and decreased as feed flow increased. However, the SDR, which involves both degradation rate and biomass requirements, increases as flow rate increases. Finally, among the feed flows tested, taking into account both the degradation efficiency and the SDR, 2 mℓ·min-1 was found to be the most convenient for CP degradation in fed-batch systems. An even higher degradation efficiency, of 97%, and a higher SDR, can be achieved using a feed rate of 2 mℓ·min-1 which is followed by an additional batch post-treatment of 2 h.
Support was provided by grants from the National University of Mar del Plata (15/G247) and the ANPCyT of Argentina (PICT N 00556). I. Durruty holds a fellowship from CONICET. E. Okada acknowledges the CIC for a fellowship received. S. Murialdo is a staff researcher of CIC (Province of Buenos Aires). Received 16 December 2010; accepted in revised form 5 September 2011.